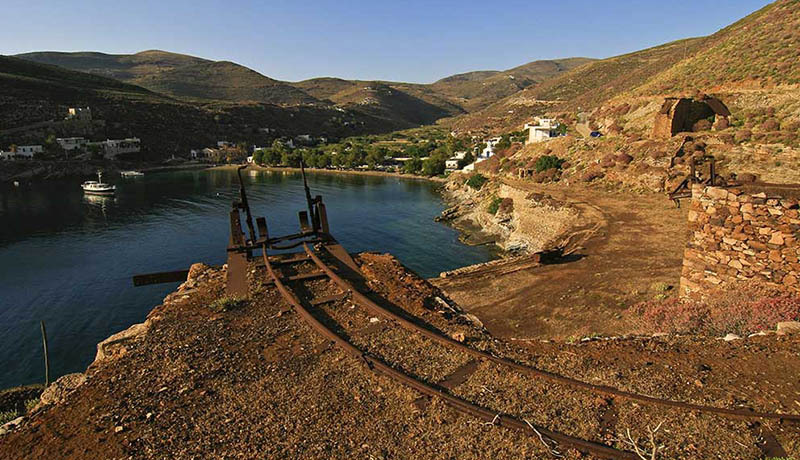 Megalo Livadi: This is one of the most significant attractions of Serifos. The village is built inside the fertile and peaceful valley that goes downhill from the area of Mavra Voladia. It is the newest village of the island, as it was built in 1880, when the mining company “ Seriphos-Spiliazeza” moved its headquarters there. During that period the commercial activity that was developed was greater than that of Chora, the island’s capital. There where grocery stores, shoemaker’s shop, bakeries and a chemical lab oratory. 700 people came to live in Megalo Livadi from the surrounding islands of Mykonos, Paros, Mylos, Sifnos and specialized miners from Italy as well. During 1900-1914 an elementary school operated, the so-called “Gromanneios School”. On both left and right of the bay there were located two ore-loading ladders -in fact, one of the still exists. The dominating neoclassic building designed by Tsiller, which decays at the edge of the coast, used to house the offices of the mining company and also served as the permanent residence of the director of the mines. The Taxiarches Monastery: Another attraction of Serifos island which you should not miss! It resembles a medieval castle, having embrasures, murder-holes and high surrounding walls (8-10m) in order to be protected from attacks of the various besiegers. Its’ only entrance is located on the west side of the top of the steep stairs. 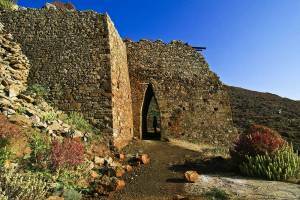 You need to fold in half in order to pass through, the short wooden door and enter in the precinct of the monastery! The minimal architecture and the remarkable plasticity of the buildings convey a peaceful feeling. The tricorne church, dedicated to the archangels Gabriel and Michael, stands in the middle of the precinct and is surrounded by cells built on different levels. According to the Code of the monastery, that was written by Abbot Kallinikos Gryparis (1783-1795), it was built between 1570-1572. From the beginning the monks had under their management the fields of the Venetian Abbots as well as the property of Theotokos Monastery in Panagia village. Thanks to its great economic power, it pioneered in the commerce, while it also served as a religious, social and educational centre for the people of Serifos. During the Turkish occupation the Taxiarches monastery numbered 100 monks. In the premises you will find remarkable relics that have survived such as the gilded iconostasis and the library that was built in the 1909. Unfortunately, the church mural depicting the fight of the Archangel against the beast of the Revelation, the dragon, who swallows kings and bishops, has only partially survived. From the Abbey’s terrace you can enjoy the lovely view of the north side of the island. We suggest that you visit the monastery during the Holy Week and Easter as well as on November the 8th, which is the date when the official celebration of the Archangels take place. It is located in the east-side of the island, following the Kallitsos village, next to the village Galani. For more information and visiting hours: +30 22810 51027.